It is said that “A mentor is someone whose hind sight can become your foresight”. In other words a mentor is a person who is senior and who provides guidance and assistance to a junior or mentee. Why do we need a mentor? Mentors can help one achieve the career and life that one wants and deserve, so we all need mentors. Mentors are important source of career advice and we do not have all the knowledge and the time to learn everything all by ourselves so we need mentors. Even the richest man in the world Bill Gates had a mentor. Dr Ed Roberts mentored Bill Gates before the success of Microsoft. Steve Jobs of Apple was mentored by Robert Friedland and closer home India’s biggest leader Gandhi Ji was mentored by Dada Bhai Naroji. At ICICI Bank KV Kamath, who is now executive chairman has mentored many and one of his protégé Chanda Kochar is now the managing director. 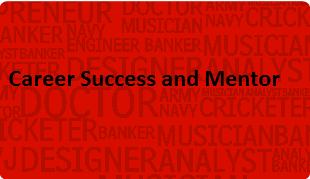 So we can conclude that people in all walks of life and at all stages of career need mentors. Mentors inspire us and help us do what we need to do to achieve success. Like in case of Steve Jobs his mentor helped him improve his personality and in case of Bill Gates his mentor Dr Ed Roberts, who was the founder of Altair 8800, inspired him and his co founder to start a company of their own. Like that mentors play many roles and help the mentee do the needful to achieve success. Mentors are important so should we all start looking for a mentor? The answer could be No and Yes both. You do not need to go searching for a mentor because in many cases the mentors and mentees have met in the normal course of business/ day to day life. Steve Jobs had gone to sell his typewriter to his future mentor; Bill Gates was an employee of Dr Ed Roberts. So you may meet your mentor anywhere, within your organization or may be outside. But if till now you are not so lucky and haven’t found your mentor, you need to go searching for a mentor. The opportunity comes to a prepared mind. Keep your eye and ears open. Is there a client, ex boss, acquaintance whom you admire or would like to acquire some of his / her traits? That person may be your mentor. When you are sure about that person, make the first move and ask. Tell them that you admire them and would like to learn from them. Most likely you will get the nod but if you don’t, you can still follow the person and learn. Like in case of Nelson Mandela who was never closely mentored by Gandhi Ji but followed his ways and considers him a mentor. ? What qualities should be there in a mentor or how to identify the right mentor? A mentor is a positive individual first of all and someone who is willing to share one’s wisdom, knowledge and expertise. Someone who is respected by his/ her colleagues for his humane traits. Someone who has the ability to give feedback and also suggest alternatives/ one who is sought after and his opinions are valued by others. Another important characteristic of a mentor that the mentee should look for is that the mentor should be genuinely interested in the success of the mentee and should not see the protégé as threat. So rejoice if you have found a mentor and if you are still to find your mentor then go ahead and search for him /her using the criterion listed above. Happy Career Building !